There has been an increasingly urgent need for sustainable living in all aspects of life, and the travel industry is no exception. Ecotourism, also known as green tourism or ethical tourism, has grown exponentially in recent years since first being introduced in the 80s. As outlined by The International Ecotorism Society the definition is “responsible travel to natural areas that conserves the environment, sustains the well-being of the local people, and involves interpretation and education”. Ecotourism comes in many forms such as glamping, farm stays, adventure tours and so much more. Luckily, the world is beginning to realize that incorporating sustainability into everyday life is important. Some of the leaders in this initiative are Australia and New Zealand. Ecotourism has blown up in these two countries helping to set a precedent for others. Contributing to this form of travel is also not black and white. There are many ways to engage in these practices. Some of the more typical aspects of ecotourism are the green initiatives. This can be installing solar panels, recycling, reusing materials or containers, water conservation and much more. Sayings such as “pack in, pack out” or “take only pictures, leave only footprints” highlight major points in ecotourism. The goal is to preserve wildlife, flora and fauna as well as leave no trace. A lesser known aspect of ecotourism — however not complete without — is to protect local peoples and businesses. Having a positive impact on the economy is key to contributing to ecotourism. Bottom line is that ecotourism should have a positive impact on the environment, local people, the business owners, and even the travellers. There is a need for long term effects rather than short term solutions. 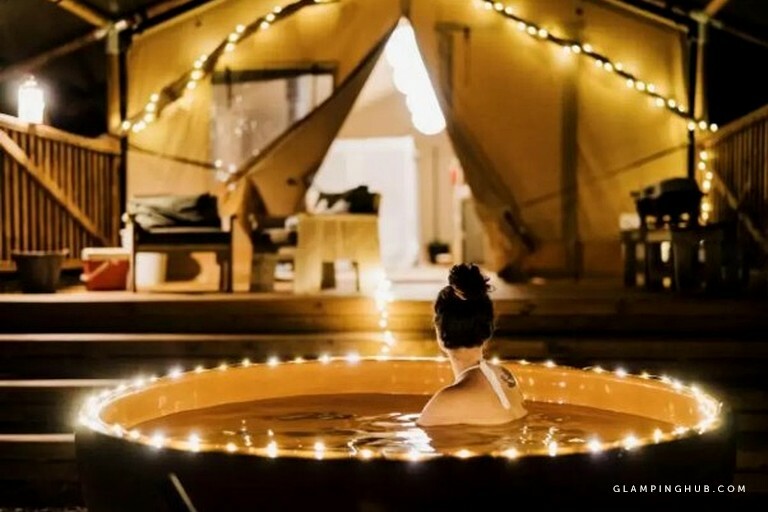 As mentioned above, a more unique travel offering that encourages eco-friendly habits is glamping. For those unfamiliar, glamping is “glamorous camping”. From comfortable cabins to luxury safari tents, there are many ways that this form of travel encourages sustainability. 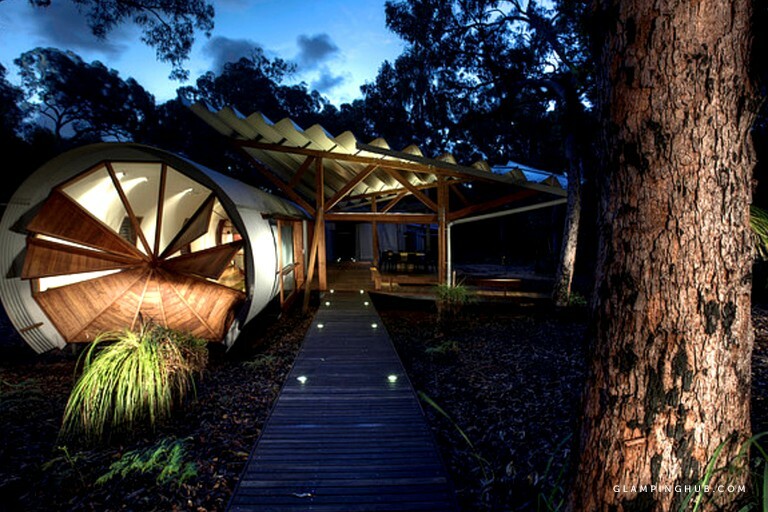 Glamping structures often are not permanent and therefore leave minimal impact on the environment. These accommodations do not deliver constant damage as a major resort would. A lot of glamping accommodations have no electricity or use it minimally. This means less overall energy use. Some glamping sites have shared restrooms and facilities which serves for consolidation of waste. Glamping can even be considered less impactful than regular camping since most amenities are already available such as a bed, linens, or even food, which allows for less waste left behind because less is brought in. Glamping accommodations are sometimes built from refurbished structures such as campervans, barns, or shipping containers. Finally, glamping allows people to interact and immerse themselves in nature. Hopefully, this helps travellers respect the world around them. 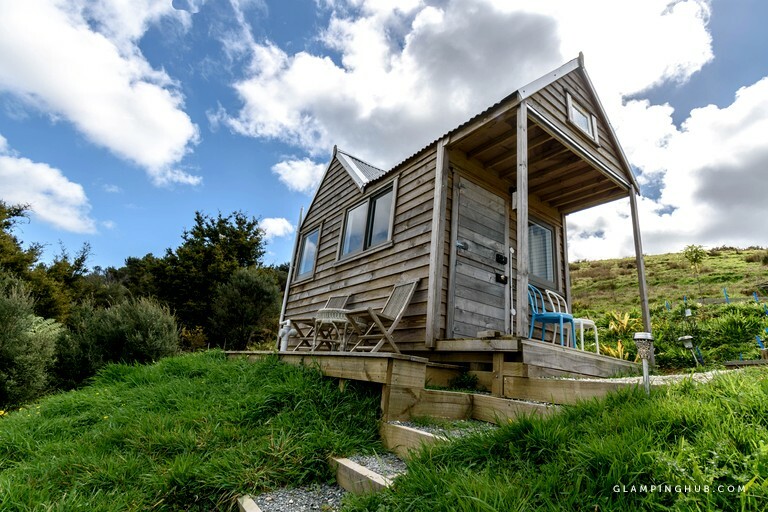 Take a look at some eco-friendly glamping accommodations that are available around Australia and New Zealand! 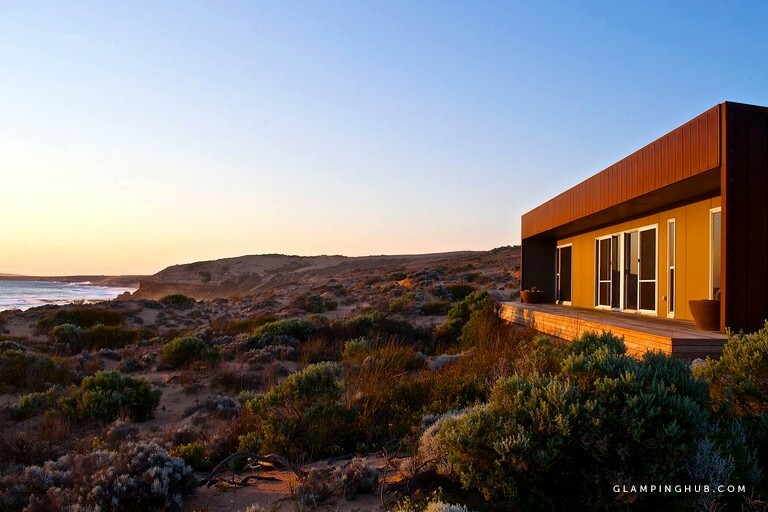 This Venus Bay, South Australia accommodation starts at $420 a night. Enjoy the beautiful coastline of Venus Bay at this eco-friendly cottage. The accommodation utilizes rainwater and is equipped with solar panels. Guests of up to four can enjoy views of the great outdoors and wildlife while not excluding any luxury amenities. This Kaikoura, South Island accommodation starts at $636 a night. The special getaway overlooks the rocky yet gorgeous landscape above the Kahutara River. 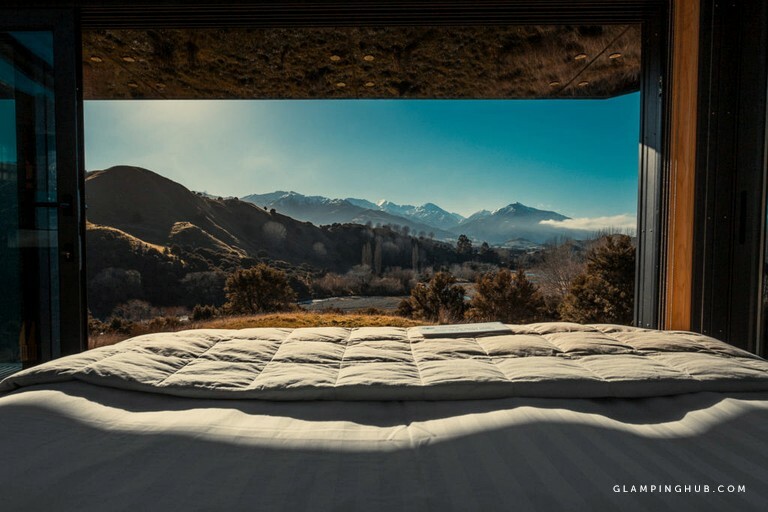 Experience a unique stay with glass walls and ceilings allowing you to truly take in the outdoors. The pod uses solar power for LED electricity and everything is already available for guests when they arrive so minimal packing is required — even food for a bit extra! The remote, beautiful glamping tent includes fabulous amenities like the outdoor hot tub, deluxe linens and a wood burning stove. Do not be fooled by the glamour of the glampsite because the grounds include energy efficient utilities, a compostable toilet and off-grid solar. This Agnes Water, Queensland accommodation starts at $382 a night. This special pod rental is perfect for a one of a kind travel experience. Guests can explore this fascinating structure while enjoying wildlife and bush and the private covered deck. The low impact rental reuses rainwater and heats water with solar. This Kaiwaka, North Island accommodation starts at $97 a night. Take in the 31 acres of farmland while staying in this adorable tiny home. The sustainable glamping grounds include shared facilities as well as eco-friendly laundry and shower supplies available for guest use. This Avoca Beach, New South Wales accommodation starts at $219 a night. The adorable bell tents are everything and more for a relaxing stay surrounded by bush. For an extra cost, guests can schedule a massage or a tour through the surrounding nature. The ground facilities include an eco bush toilet and shower. This Youngs Siding, Western Australia accommodation starts at $188 a night. The amazing elevated cabin rental is perfect for a spectacular stay overlooking a vast rural landscape. The 50-acre property was revegetated by the hosts and have planted more than 3,000 local trees to attract wildlife. 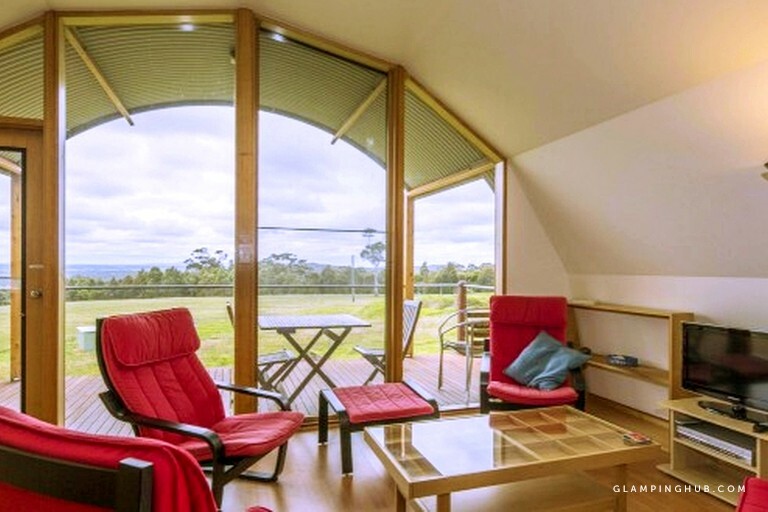 This peaceful cabin protects animals and nature while also letting guests enjoy the beauty of Australian landscapes. 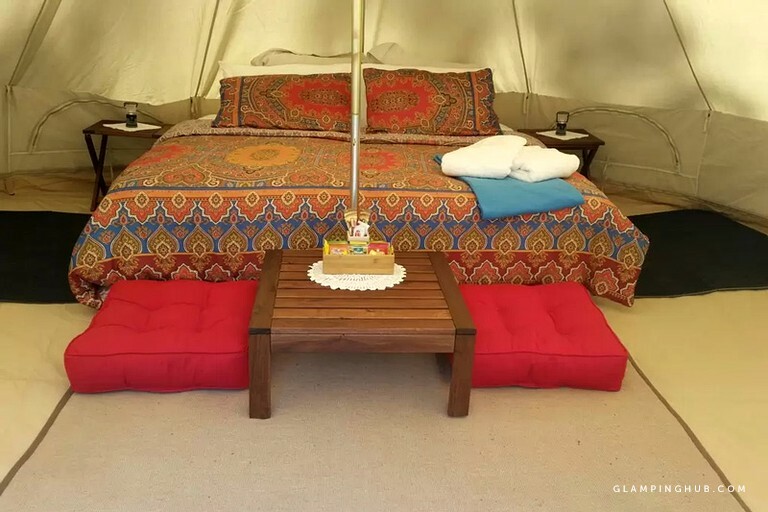 All of these accommodations are available on Glamping Hub. The information above is provided by Laura Grant of Glamping Hub. Happy eco-friendly glamping!